I'm back once more to provide you with further commentary on Toho property kaiju films. 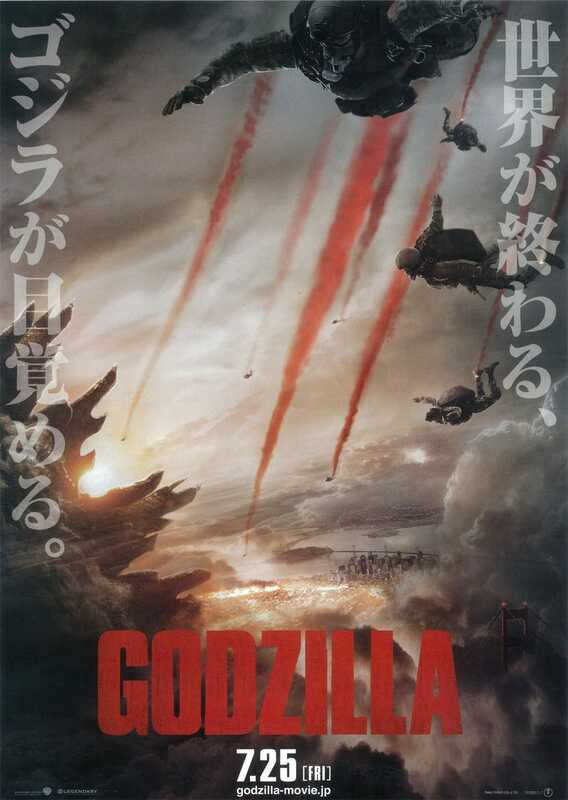 I originally intended to follow up my last review with a look at Invasion of Astro-Monster, but I got caught up in prepping for graduation and so found myself behind schedule when Gareth Edwards' Godzilla hit theaters two weeks ago in a big way. Considering I started this series of reviews as a celebration of the film's impending release, it felt only right that I'd take a break to offer my thoughts on what I thought of America's second attempt at the Big G.
When I first learned that Toho was licensing Godzilla out for another American adaptation I wasn't sure what to think. Hollywood's first try at the King of the Monsters was a big success when it came out, but it's suffered horribly in popular memory and is widely regarded as a creative disappointment, even if it made loads of cash ($551 million, when adjusted for inflation). It seemed unlikely Warner Bros, Godzilla's new American caretaker, could botch the job as badly as TriStar did. But I still wondered if something as characteristically Japanese as Godzilla could translate well to an American film. My worries were largely alleviated last year by the release of Pacific Rim, which was, for all intents and purposes, an enthusiastic and unapologetic Showa-style Godzilla film in all but name. I didn't have especially high hopes going in, the trailers having done little to excite me, but I was quite impressed with what I actually saw, which was a fun and engaging film that had great action, a good sense of humor, and surprisingly endearing characters (even if they weren't terribly complex). Better yet, the film was produced by Legendary Pictures, who had also been charged by Warner Bros with the development of Godzilla. Here, I thought, are people I can trust to do the King justice. Ah, if only. Legendary's version of Toho's most famous creation is definitely better than TriStar's bizarre iguana, but to call it a truly great Godzilla film is (unfortunately) an exaggeration. Gareth Edwards' Godzilla has its charms - the monsters look great, it has a palpable sense of tension at a few key points, and the soundtrack is pretty good. But its also weighed down by a number of problems - an aimless plot, tonal inconsistency, thoroughly dull characters - which hamper the film significantly and make it much less than it could have been. In all fairness, Godzilla gets off to a pretty great start. The opening credits sequence, which briefly summarizes humanity's first encounters with the film's eponymous monster, is extremely well-composed and makes great use of 1950s recordings of real-world nuclear weapons tests. After this imposing opening, we next see Ishiro Serizawa (not to be confused with his namesake from the 1954 film, who's an entirely different character) and his assistant Vivienne Graham investigate the carcass of an ancient monster in the Philippines, which they conclude was eaten alive by parasites, one of whom's offspring has now escaped into the Pacific. In the process, Serizawa drops a line that provides the film's revised explanation for Godzilla - he's one of several living fossils from a (fictional) period in Earth's history when the world was much, much more radioactive. Fair enough and actually pretty accurate to the 1954 film's rationalization. Thereafter, we travel to the fictional Japanese city of Janjira, where we meet Joe Brody (played by Bryan Cranston) and his wife Sandra, who both work at the local nuclear power plant. It's never really explained why two (white) Americans are in charge of a nuclear power plant, but we can probably assume it has something to do with the (false) idea that American audiences need white characters to latch on to. Brody, who has been detecting unusually regular seismic disturbances for some time, tries to warn the plant's management that a disaster may be imminent. Although his colleagues eventually wisen up, they are too late to save Brody's wife and several other plant workers, who are caught inside when an explosion occurs, breaching the reactor's contamination controls. Brody, his coworkers, and all of their families are immediately evacuated and Janjira is put under quarantine. The film picks up fifteen years later, in 2014, as Brody's son Ford returns home to San Francisco, after a tour of duty as a United States Navy explosive ordinance disposal expert. Expecting to get some much deserved relief, Brody Jr. is instead called to Japan by his father, who has been arrested for trespassing in the quarantine zone. Reluctantly, Ford flies across the Pacific and bails out his father, who continually asserts (to anyone who will listen) that the Janjira reactor failure was not the result of an earthquake but of something else, which the Japanese government has covered up. After trying in vain to convince his father to give up his crusade, Ford agrees to accompany his father back to Janjira one more time, at which point he learns (surprise, surprise) that his father was right all along. Janjira isn't radioactive, the Japanese government (or rather the American government, bizarrely) has been covering up the truth, and the truth of what happened at Janjira is far stranger than he could have imagined. Rather than an earthquake, the nuclear disaster was caused by the larval form of a giant organism the U.S. government has dubbed a MUTO (Massive Unidentified Terrestrial Organism), an organism which has sense entered a dormant phase, allowing Serizawa and his colleagues to study it. Of course, this is a monster movie, so it should be no surprise the monster escapes. After feeding off of all the ambient radiation in Janjira for a decade and a half, the MUTO has now reached its mature form and emerges from its chrysalis to lay waste to the American military base before flying across the Pacific, presumably to meet its mate, which Serizawa informs Ford has been stored in Yucca Mountain, Nevada. The U.S. Navy immediately launches into pursuit, during which time Serizawa mentions that the MUTOs are not the first radioactive monsters the U.S. government has encountered and that the original threat which prompted the creation of the secret Project Monarch was actually an "ancient alpha predator" known as Gojira. It's actually a pretty decent set-up. The opening scenes in the Philippines and Japan establish a real sense of foreboding that helps us swallow the improbability of ancient radioactive titans, slumbering away in the depths of the oceans. You get a real feel for how these monsters are primordial, inhuman, and incomprehensibly powerful. Cranston's character, Brody Sr., while a bit of a stereotype is engaging and sympathetic, particularly in light of his wife's horrific death, which Edwards renders for us in painful detail. The (formerly) radioactive wasteland of Janjira is chilling to behold and undoubtedly meant to emulate both the real-world disaster at Fukushima as well as the destruction of Tokyo in the original Godzilla. Unfortunately, Godzilla's first act is its strongest. Without going into too much details, the film shifts the focus from Brody Sr. to his much less interesting son, Ford, and in the same stroke relegates Serizawa (Godzilla's sole Japanese character) to the background, leaving him little more than a mouthpiece for the film's half-baked philosophy. The film's plot meanders, wanders off course, and loses whatever drive it had, becoming, in essence, an excuse to watch tiny glimpses of out-of-focus monster battles from the sidelines while the human characters react with dull surprise (there is actually a scene where footage of monsters destroying a city is on TV and no one pays any attention to it). What's more, the tone wavers erratically in the second and third acts, from dreading Godzilla in one moment, to celebrating him in the next. There's basically two main problems with Godzilla. One is that it's not a very good film, period. The characters (Brody Sr. and Serizawa aside) are dull and uninteresting, with little to distinguish them from one another besides their names or familial relations, who do almost nothing but react to what's going on around them. The story, post-first act, is a pretty clear example of what I call the "stuff happens" plot: things happen, for no really identifiable reason, and the human characters react to said things with no real agency or control. While this may be "realistic" (a descriptor I would actually argue with) it isn't very interesting to watch. The second problem with Godzilla is that it isn't even a very good Godzilla movie. It's hardly the worst of the bunch - it has its strong points and it's not straight-up painful the way some are - but it's also a far cry from one of the best. The movie is, in the words of io9 commentator lightninglouie, "grindingly competent" - capable of hitting all the right marks but never really engaging you in any kind of emotional way. The direction isn't bad, the special effects look good, and the music is great, even if it would have been nice if it had paid more tribute to Ifukube. But I didn't feel anything, at least not after the first act, and the film is ultimately kind of soulless. The second kind of Godzilla film, typified largely by the later Showa films, is quite a bit different. Instead of a hostile and misanthropic behemoth, the second Godzilla is a protective, even friendly watchdog who protects Japan (and Earth in general) from other monsters and alien invaders. Whereas the first kind of film is usually fairly dark (or at least intends to be), with a lot of philosophizing about humanity's arrogance or whether we deserve to survive and what not, the second kind is usually pretty light and filled with a lot of comedic moments that embrace the genre's somewhat inherent campiness with a wink and a smile. I personally prefer the first kind of Godzilla movie, but I enjoy the second kind as well, especially when it's done well. From the trailers, the publicity campaign, the opening credits, and the film's first act, you'd probably expect Gareth Edwards' Godzilla to be an example of the first variety: dark, brooding, and filled with a fair amount of nuclear-fueled dread. But in actuality, the film's something of a hybrid and large parts of the second and third acts revolve around Serizawa's belief that Godzilla is our salvation and not our destruction (which is unintentionally humorous considering the role of his namesake in the original film). Unfortunately, these elements don't play very nicely with one another; the movie's grimmer than a light take allows, but it lacks the thematic weight and horror of the series' darker films and so comes off half-baked. What's more, Godzilla tries so hard to be the serious kind of kaiju movie (even if it's unwilling to commit to the logical implications) that it never really tries to be fun. We barely catch a glimpse of Godzilla at any point in the film - just bits and pieces here and there - and the monster fights are startlingly brief. There's almost no humor either, and the human characters are all dour, moody, and kind of expressionless. In a way, this fits with the film's grimly serious aspirations, but again, it doesn't really jive with the film's earnest celebration of Godzilla as a pseudo-protagonist. After all, if we're supposed to be taking this so seriously, why should we root for a monster that's probably caused as many deaths as the MUTOs? I really wanted to like Godzilla. And I did, in a few ways. Like I said, the opening credits and the first act are both really good and give a glimpse of what the movie could have been. The music, composed by Alexandre Desplat, is really quite excellent, even when the film itself is not. And I really liked Godzilla's design in the film, even if he does seem a bit heavier than previously. The fights, as brief as they are, are well-composed and I loved the way the SFX team rendered Godzilla's atomic breath. I even liked the MUTOs, which reminded me a little of the meganulons from Rodan and Godzilla vs. Megaguirus. In the end though there's just too many problems, even for a kaiju movie, for me to embrace Godzilla uncritically. And I spent way too much time comparing it to better entries from the series in my head, which is never a good thing. It's an okay film; it's even fun on occasion. I'm glad the movie's making money (and will probably get a sequel). But it isn't what it could (or should) have been.